The final phase in the refurbishment of Bedford Heights is now finished, with a brand new reception and landscaped entrance completing the transformation of the former home of Texas Instruments into what is now Bedford’s premier business centre offering contemporary office and conferencing space. 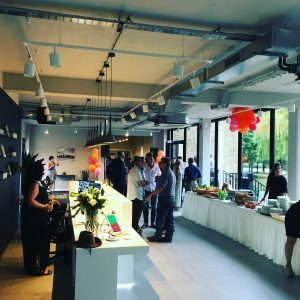 To celebrate this milestone, Bedford Heights held a Summer Party and Official Opening on 18 July with a whole host of Bedfordshire businesses and organisations joining us to see for themselves what is on offer. The iconic building, which has stood proud on Manton Lane since 1960 when it was purpose built to house Texas Instruments, has benefitted from significant investment and refurbishment in recent years, improving the space to become Bedford’s premier business centre. Tim Pain is Managing Director of Verve Developments Ltd, which owns Bedford Heights. He said: “Bedford Heights is a fantastic building with a really interesting heritage and we are delighted to now be able to present this final stage in the building’s refurbishment to businesses in Bedfordshire. 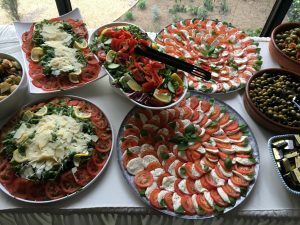 At the Summer Party and Official Opening on 18 July, guests enjoyed food and drink from local Italian deli and caterer Foods of Italy, accompanied by entertainment from Cuban band The Sugar Kings. Guests were also encouraged to submit photos and other mementos for the Bedford Heights Time Capsule, which will be buried later this year. As well as businesses, representatives from local schools, organisations and charities all enjoyed the summer party. Bedford Heights is supportive of the local community and has previously donated funds and time to various organisations with an ongoing commitment to support initiatives that benefit the town.